I’ve been drinking almond milk in place of cow’s milk for the past 7 years. Or so I thought. I had been purchasing brand name almond milk from grocery stores out of convenience. It wasn’t until I started making my own milk that I realized what I was purchasing doesn’t come close to what almond milk should taste like. 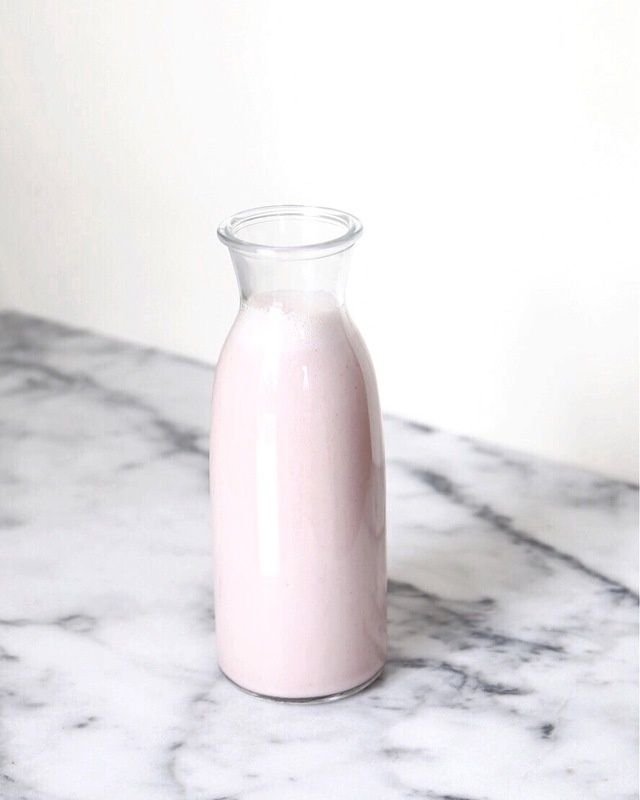 Almond milk requires two ingredients: water and almonds. It shouldn’t be any other way unless you want to add natural ingredients for flavour. I recently went to Los Angeles on vacation and stumbled upon Moon Juice. Moon Juice is basically the holy grail for holistic enthusiasts. They sell organic pressed juices, nut milks, raw provisions, and various plant-based remedies. I fell madly in love with their nut milks, which they refer to as ‘moon milks’. They come in the most amazing flavour combinations. I stopped by daily to drink something new. Deciding between flavours like vanilla fig hazelnut milk or sesame ginger matcha milk was not easy. It’s safe to say that this recipe is inspired by moon milk. An ingredient you may not recognize in this recipe is lucuma powder. Native to Peru, lucuma fruit has been enjoyed for centuries and referred to as ‘Gold of the Incas’. Today lucuma is celebrated for it’s high amount of antioxidants, vitamins and minerals and it’s low glycemic index. Some research suggest lucuma powder can reverse the effects of aging with it’s tissue regeneration abilities. With it’s maple like flavour, lucuma is a a great addition to this recipe. I love drinking this milk plain for breakfast. However, I also recommend using it in place of milk in your favourite granola, oatmeal, or chia seed puddings. Place the almonds in a bowl and cover with water. Allow to soak for 6-8 hours or overnight. Drain the nuts and transfer to a blender with strawberries and filtered water. Blend on high for 45 seconds until the liquid is milky. Be sure not to over blend. Place a nut milk bag, cheesecloth, or a very fine sieve over a large bowl and strain as much milk mixture as possible. The almond strawberry pulp should be almost dry. Place the strained milk back in the blender. Add the medjool date, lucuma powder, rose water, vanilla extract and salt. Blend until frothy. Transfer milk to an airtight glass container for 3-4 days. This entry was posted in Breakfast and tagged almond milk, breakfast, healthy, lucuma, nourish, superfood, Vegan. Bookmark the permalink.